Though suicide is a self destruction form, indirectly it brings hurts to our loved ones. The Suicide Fish* mainly is the decision of a fish who loses his hope and will to live. Suicide seems to be the best solution to the problems we face in everyday lives. Refusing to acknowledge the truth causes self-denial leading to self rejection. Probably, we misunderstand the concern from our loved ones. They either speak the truth harshly or gently with a certain body language. Misinterpretation is similar to filter. As the air carries their words into our ears, we miss out some words. Losing the connected words causes the head and tail to become the conclusion. Speaking to younger children is a challenge to the adults. Many adults complain their kids’ misbehaviour and lack of obedience. Throughout my experience, I realized my son tends to capture the last words and acts it out. “Don’t jump!” He will jump. Conversation between my friend’s mother and helper is another good case of misinterpretation. The helper ever mentioned to her that she (helper) wanted to have four children whereas her friend has six children. She said the same thing to my mother in the next couple of days. When my mother commented my helper wants to have six children, I don’t believe. After I check out their conversations, I explain to my astonished mother. Whenever I am going to attend workshops, voice recorder is the first thing I often grab on. When I listen to it again, I realised the in-between missing words. Let’s take this article’s title as an example. “Think before suicide” is the theme of my topic. For example, “before” is the lost word to the recipient’s ears. So it will sound “think suicide”. Obviously, the recipients definitely will be upset and feel devalued resulting in angry person who may or may not commit suicide. Isn’t it good to really open our ears to hear the speaker? 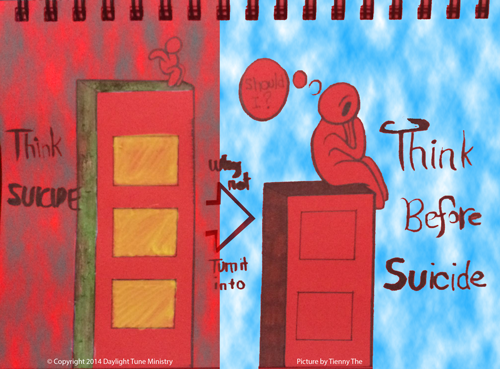 Rather than, thinking suicide, why not think before suicide? * School Animation by our friend. Posted in Devotional and tagged Angry, Contemplation, Devalue, Filter, Fish, Lost, Misinterpret, Misunderstand, suicide, Word. Bookmark the permalink. A bar of RAM is damaged! The computer system is alive again. A fish body is turned upside down. The whole fishes will also die. Dirt floats onto the river. Receive cleansing through His blood. At first, I thought that the motherboard was damaged. My heart felt down. As I was troubleshooting my computer CPU, I was reminded about the RAM. Then I tried removing each of the two bars of RAM. When I found out that a bar of computer RAM was the one affecting the whole system down, the above inspiration birthed out. Followed by the concept of a dead fish in the aquarium. My heart feels joyful and satisfied that my hard work is not in vain. Thank God for that. Posted in Free Verse, Poetry and tagged Access, Affect, Aquarium, blood, Christ, Clear, Computer, Conscience, CPU, Damage, darkness, dead, die, down, Fish, harm, Memory, Poisonous, RAM, Random, Rhyme, Rhythm, river, Simile, System. Bookmark the permalink.